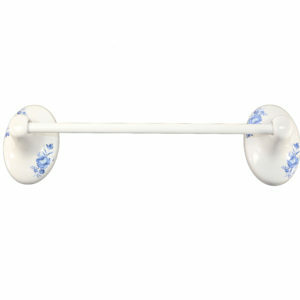 Need ceramic towel bars and towel racks for your bathroom? Plum Street Pottery carries many styles of vintage towel bars and towel racks by Lenape, from wall mount ceramic towel bars that you can easily install yourself to The ProSeries towel bars designed to be installed by professional tile installers or the experienced DIY’er. 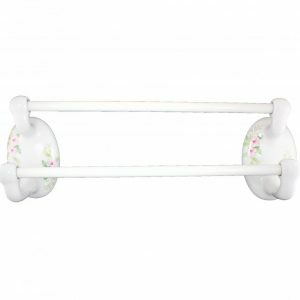 Our selection ranges from classic, unadorned white ceramic towel bars to more decorative ceramic towel racks accented with blossom, watercolor or blue floral patterns. 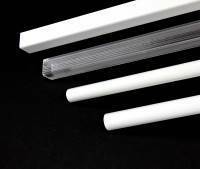 We also offer replacement towel bars in different lengths and widths and in your choice of clear or white plastic. In addition, when a towel bar breaks we have the replacement towel bars with spring ends. They install in a snap! 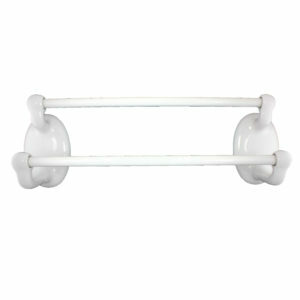 Not only are ceramic towel bars and racks attractive but they are durable and easy to keep looking like new. An occasional wipe with a damp cloth is the only maintenance required. The ProSeries ceramic towel bars are typically installed by a professional or the experienced handyman homeowner, but there are also many styles of Clip-On ceramic towel racks and bars that homeowners can install. The Lenape ProSeries requires a tiled grout in, thin-set installation. In other words, the 5/16″ back fits into a 5/16″ or deeper recess between the tile and the wall. Most tiles are approximately 5/16″ thick. The flange fits over the edge of the tile to maintain a neat trim appearance. The edge of the flange must be sealed with a high quality caulk like silicone. It is important to maintain the caulk to prevent water penetration. The Clip-On wall mount ceramic towel bars are clipped directly to virtually any surface, from wall board to tile. 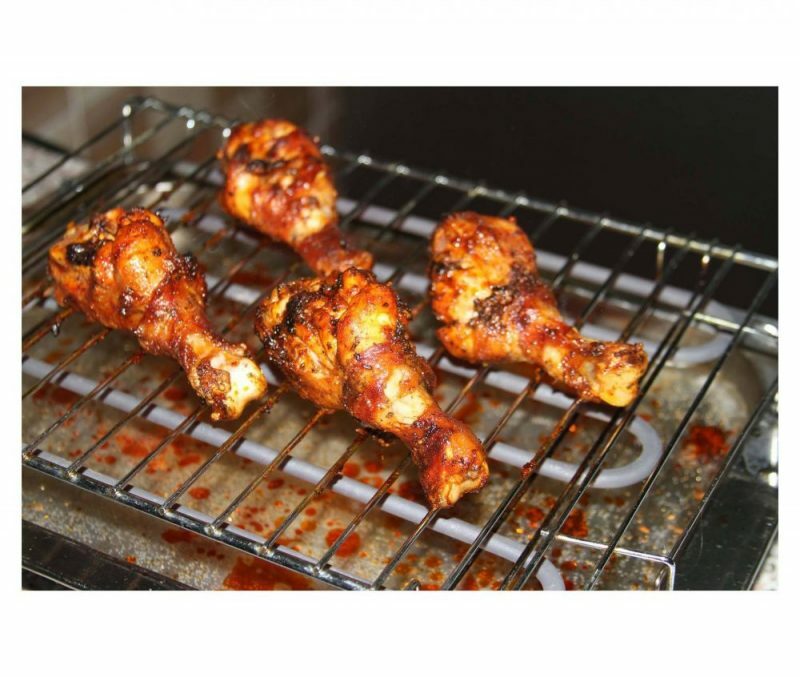 The corrosion and rust proof mounting hardware is included. 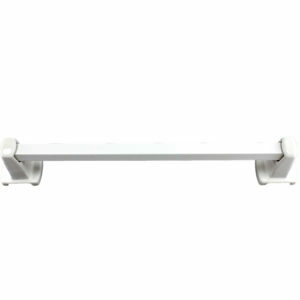 Then we have wall mounted ceramic double towel bars that give you extra room to hang hand towels and bath towels without taking up more wall space. These are perfect for the smaller bathrooms that only have room for one towel rack. 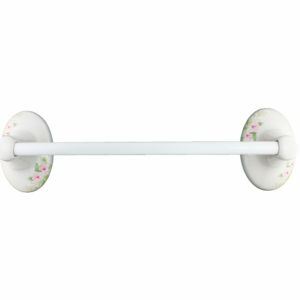 We offer the Clip-On wall mounted ceramic towel bar sets in 18 inch, 24 inch and 36 inch. If your required dimensions are different you can easily cut the plastic bar to your exact size. One of the handiest products we sell is the Lenape Re-Place-A-Bar. This is the original replacement towel bar that easily fits into the ceramic towel bar posts. There is no need to tear out the towel bar posts. Simply cut the towel bar to your desired length, depress the spring ends and insert into the ceramic towel bar posts. For classic looks, durability and functionality, Lenape ceramic towel racks from Plum Street Pottery make a welcome addition to any bathroom. Shop online and order today. We do provide detailed ProSeries Installation Instructions , Clip-On Installation Instructions and Replacement Towel Bars on each product page.